The sun is finally beginning to make an appearance in Seattle, and it’s just in time for some awesome summer events happening at Seattle Center and Downtown! 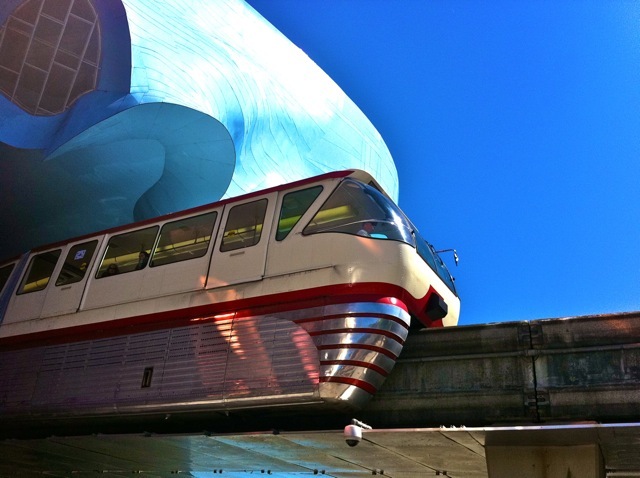 The Monorail is open M-F 7:30 AM to 11:00 PM, Sat & Sun 8:30 AM to 11:00 PM. The train departs approximately every 10 minutes! More information can be found on the Monorail Website. In Downtown, there are FREE summer concerts during lunchtime on Wednesdays and Fridays from noon to 1:30 PM at various parks throughout Seattle. The summer concert series is a part of the Out To Lunch 2011 Campaign. For the complete list of bands and locations, visit the Downtown Seattle Association Website. Concerts at the Mural take place on Friday evenings during August at 6 PM at the Mural Amphitheater. Some of the bands featured include: Hey Marseilles, Fool’s Gold, Mad Rad, Seapony, My Goodness, Whalebones, and Ravenna Woods. The complete band line-ups are on the Mural poster above. Take advantage of these five, all-ages shows. The shows are FREE. There will be a 21+ beer/wine garden at the events. Come cool off at Seattle Center’s International Fountain! The Fountain is located between KeyArena and Memorial Stadium. All of the water is recycled and it’s probably the cleanest int he city with three types of water treatment before it ever reaches the public. It was originally built for the 1962 World’s Fair (like the Monorail) but was completely replaced and expanded in 1995. The super water shooters can reach a height of 120 feet and the water in one super shooter is 66 gallons. There are several water programs that are synchronized to music throughout the day. On a hot day, the Fountain is the best place on campus to cool off. The 10th Annual Seattle Tattoo Expo takes place at Seattle Center inside the Northwest Rooms August 12, 13, and 14th. The Expo will feature talented new artists and include popular fan favorites. You can buy a VIP 3 Day Platinum Pass for $94.50, a 3 Day Pass for $47, or 1 Day Passes for about $16. To purchase tickets online or learn more, visit their website. Come check out Seattle’s Music and Arts Festival: Bumbershoot at Seattle Center September 3-5. This year, Bumbershoot features an incredible line-up of fan favorites and new artists. Some of the featured artists include: The Presidents of the United States of America, Minus the Bear, Macklemore & Ryan Lewis, Wiz Kalifa, Brite Futures, Vendetta Red, and more! For a complete line-up, visit the Bumbershoot Website. This entry was posted on July 28, 2011 by Megan Ching. It was filed under Information, Photos, Upcoming Events and was tagged with 2011, All Ages, Black Mountain, Black Whales, Bumbershoot, Capsula, Concerts at the Mural, Downtown, Drew Grow & The Pastors' Wives, Festival, Fool's Gold, Free, Free Admission, Gold Leaves, Hey Marseilles, Inception, KEXP, Labor Day, Live Music, Mad Rad, Math and Physics Club, Monorail, Monorail Hours, movies at the mural, Music and Arts, My Goodness, O Brother Where Art Thou?, Out to Lunch, Outdoor Film, Outdoor Movies, Parks, Pickwick, Raiders of the Lost Ark, Ravenna Woods, Seapony, Seattle, Seattle Center, Seattle Monorail, Seattle Tattoo Expo, summer, Summer Concert Series, Summer in the City, The Incredibles, The Maldives, The Princess Pride, Virgin Islands, Whalebones.